Healthcare is free but the wait is long, healthcare in not free, there’s no insurance covering private healthcare etc… I heard lots of confusing things about the medical system in Norway. So here is my own experience going to the doctor in Oslo. Please note, all three appointments I took were not emergencies, just a nasty wart and a general check-up, so I didn’t have the worry and stress associated to it. It’s also quite interesting to notice that despite the cold climate conditions we are not used to experiencing and lots of outdoor playing, no one in the family had to go to the doctor so far… Touch wood it stays this way! Upon arrival to Norway, you get your social security number, that you will use for everything. You are also asked to nominate a fastlege, or primary doctor which is a family doctor who you will go for all your health concerns. You’re not supposed to go to anyone else and the price is stays reasonable if you follow the rules. A friend at the French school who has been living in the area for 9 years recommended Frogner Helsesenter, a particular medical centre close to home and I picked the first available doctor there to be our fastlege, an older doctor who trains for marathons. I had to see him twice and each time I was attended by his replacement, a lady probably my age who had spent 6 months in Australia in her early 20’s! Fun! For the GP consultation I had an appointment within 10 days. All I needed to do was to send an sms to the practice and they’d come back to me with a date and time. Pretty efficient. On one of the consultation I had asked the doctor to translate prescription and tests and analysis requested by a French gynaecologist. She did that rather easily and recommended me to a local gynaecologist and to the X Ray center from that medical centre. The X Ray appointment was within a week or two but the gynaecologist appointment was 4 months later!!! No need to confirm that all the doctors I met spoke perfect English, even a bit of French so there is no language issue at all. I just practice my Norwegian when I book or confirm appointments with receptionists. The medical cost I had to bear so far was such a good surprise that it made me feel better about paying one of the highest tax rate in the world, 7.8% of which is social security contribution! What’s the wait in the waiting room? Nothing! Each time I arrived 5 minutes ahead of schedule and the GP or Specialist called me just at the exact time of the appointment. So efficient! I remember waiting on average a good hour both in Paris and in Sydney. Payment system: once you’re done with your consultation, you don’t see reception but a terminal where all you need to do is key in your birth date. It then gives you the amount to be paid, you swipe your credit card, type in your pin and you’re done! So cool! See picture above. If you watched Lilyhammer on Netflix, you’d know that Norwegians have to wear blue plastic bags over their shoes when entering a hospital. 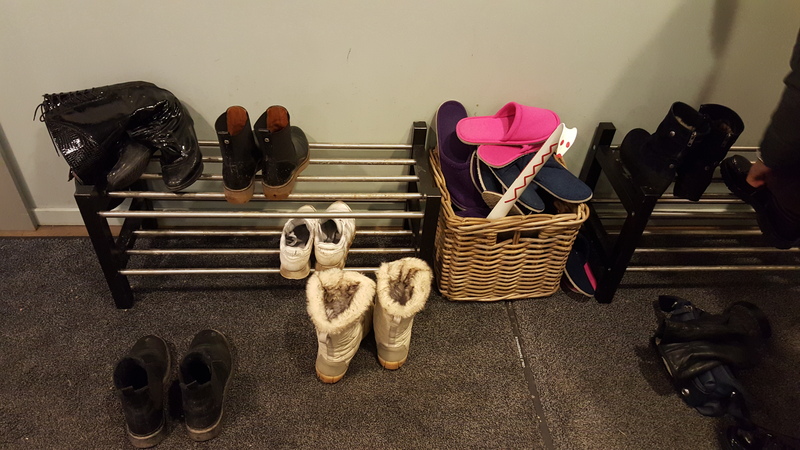 Well I got that at the gym, didn’t get that at my GP’s medical center but had a much more luxurious experience at my specialist: take off your shoes, choose some slippers from the basket and then they even provide a shoehorn to help you put your shoes back on.